Right now, the exact details of the deal are closely guarded, but a statement released regarding the situation gives us brief words from HTC's CEO Peter Chou, and Apple's Tim Cook. Chou remarked "HTC is pleased to have resolved its dispute with Apple, so HTC can focus on innovation instead of litigation." Cook, with a similar message, stated "We are glad to have reached a settlement with HTC. We will continue to stay laser focused on product innovation." We'll keep you updated as more information emerges. In the meantime, just look below for the full statement. 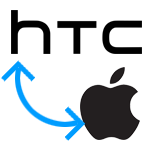 TAIPEI and CUPERTINO, California - November 11, 2012 – HTC and Apple have reached a global settlement that includes the dismissal of all current lawsuits and a ten-year license agreement. The license extends to current and future patents held by both parties. The terms of the settlement are confidential.